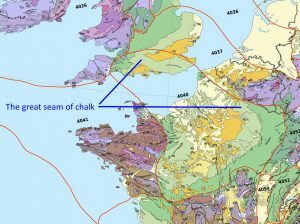 It’s often said that the unique qualities of Champagne, Chablis, Burgundy and many wines from the Loire owe much to the common bed of chalky soil of these four regions, commonly known as Kimmeridgian clay (or marl). The dominant component of this soil is limestone, the popular name for calcium carbonate CaCO3; you will probably meet it most often as the limescale in your kettle. It’s the remains of marine shells that many microscopic algae acquire as protection, as well as larger shells from molluscs and shellfish. As these creatures die the shells sink to the ocean floor and over time a sedimentary layer build ups – that’s limestone. This whole area of France was once a vast tropical sea that also encompassed southern England. Exactly why this soil helps produce great wine is not fully understood. Chalky soils can help in many ways: by reflecting light and heat onto the underside of the vine, and by retaining moisture yet providing good drainage. Also, limestone is alkaline, which is why, sadly, corals are dissolving as oceans become increasingly acidic from industrial pollution. Yet it seems that this alkaline soil helps impart refreshing acidity to the grape juice, as well as an attractive ‘mineral’ taste to the wines. So we will blithely ignore Aussie rules and return to France. How far does this soil extend? The interesting boundary is the one to the north. 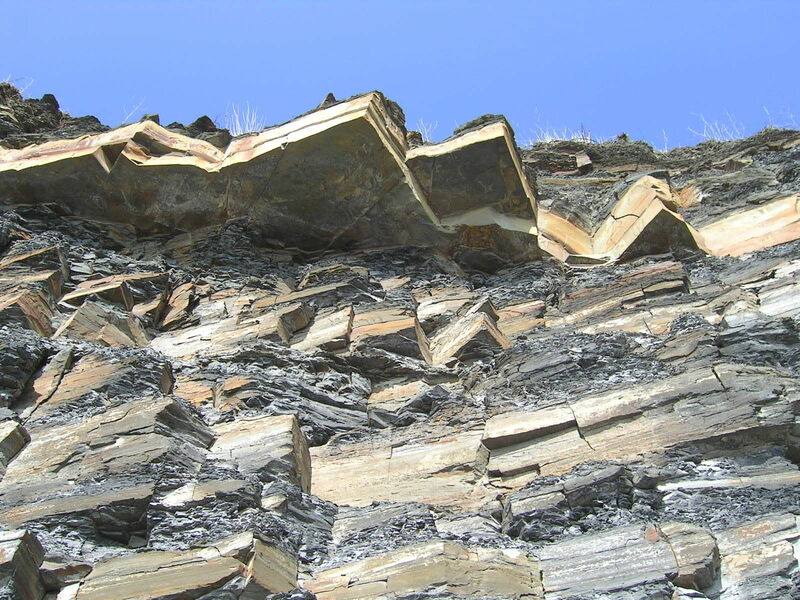 Kimmeridge is an English village on the Dorset coast which lends its name because this was where this rock was first categorised. So clearly the seam extends north under the Channel. 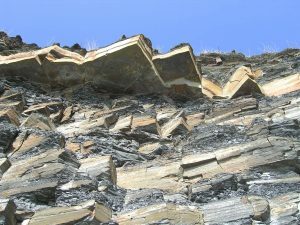 Yet the cliffs at Kimmeridge display a lot of grey and brown from bitumen and other minerals, and there is an oil-field nearby, in fact the oldest working oil-field in Britain. 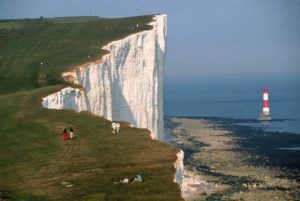 What about the white cliffs of Dover, which are a lot closer to Champagne than is Kimmeridge? Yes, they are all part of the same chalky seam. But it doesn’t stop at the south coast. Kimmeridgian clay underlies Britain’s much more famous oil and gas field, the one under the North Sea. I realised this when I visited the annual Seafood Festival held every May in the Norfolk coastal towns of Cromer and Sheringham. The main attraction is the myriad fishermen’s stalls serving freshly steamed crab and lobster, which are raised in pots on the chalk seams offshore. How do these seams connect to the Channel coast? The answer explains a lot about the increasing success of English sparkling wine. The chalk comes ashore both north of The Wash into Yorkshire (the Humber bridge rests on it) and to the south into Norfolk. From there it runs south-west across Cambridgeshire, Bedfordshire and Oxfordshire, where it is most prominent as the Chiltern Hills and the nearby Uffington White Horse. Then into Wiltshire and south through Dorset to Kimmeridge where it forms the ‘Jurassic coast’. In fact the seam splits in Wiltshire into three legs. The westerly leg is the one that leads to Kimmeridge, another runs east through Surrey and Kent forming the North Downs and then the white cliffs of Dover, while the middle one crosses Sussex forming the South Downs. Here are found many of England’s finest producers of sparkling wine, including Denbies on the North Downs and Nyetimber and Ridgeview on the South Downs. All three legs extend under the Channel to France and in fact they meet up south of Paris to form a complete loop. On the way this loop passes through Champagne, Chablis and Burgundy. Then westwards to Pouilly-Fumé and Sancerre on the Loire, where the limestone is mixed with flint and sand to form the local ‘silex’ that contributes to these appellations’ fine, smokey, Sauvignon Blanc.